​”Dirty Metric Centuries # 11 & 12. This was my third GTDRI in as many years. The weather looked like it was going to cooperate, and I was looking forward to seeing who was going to show up for the ride. We were scheduled to leave the start on the SW side of Waterloo at 0530, so I pulled into the parking lot at about 0520. I recognized Josh’s camper as I pulled in and the rest of the riders rolled in behind me. Besides Mark and Josh, the only other rider that I knew was Scott from Bike Iowa. I kept expecting Dave “New York” Roll to pull in, but he never showed up. It was still dark when we rolled out and we were heading South on Aker Rd within a mile. I could tell within a few miles that this was a strong group of riders and I was hoping that I could keep up with them all day. The first town that we passed through was Traer, and I knew most of the roads on our route there. We stopped in Traer for a few minutes before continuing South towards Toledo. 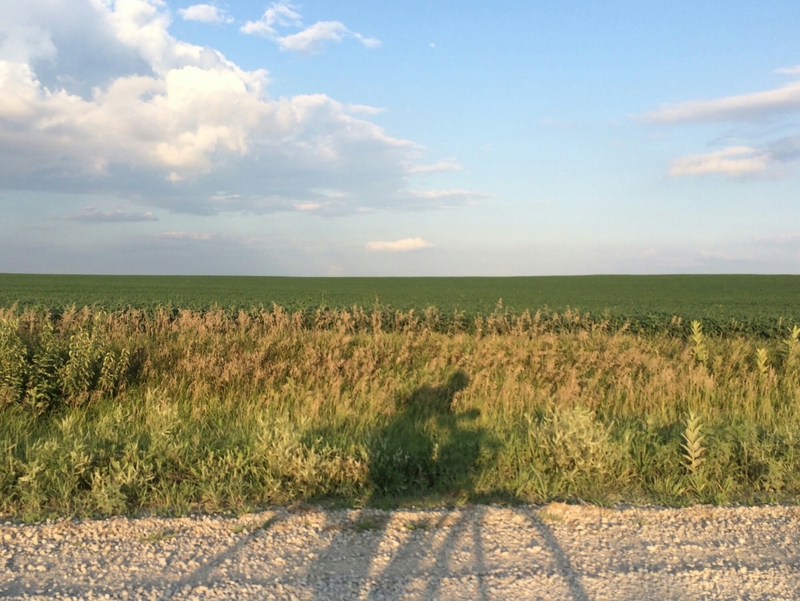 We finally hit a B-Road in the middle of Tama County; it was pretty smooth and well maintained for a two-track. We turned West and the route was starting to get pretty hilly. We topped one hill as a covey of Hungarian Partridge flushed from the middle of the road. It was good to see that this pair had pulled off such a big brood of young this year. We continued South and West until we came to another B-Road leading into thick timber. 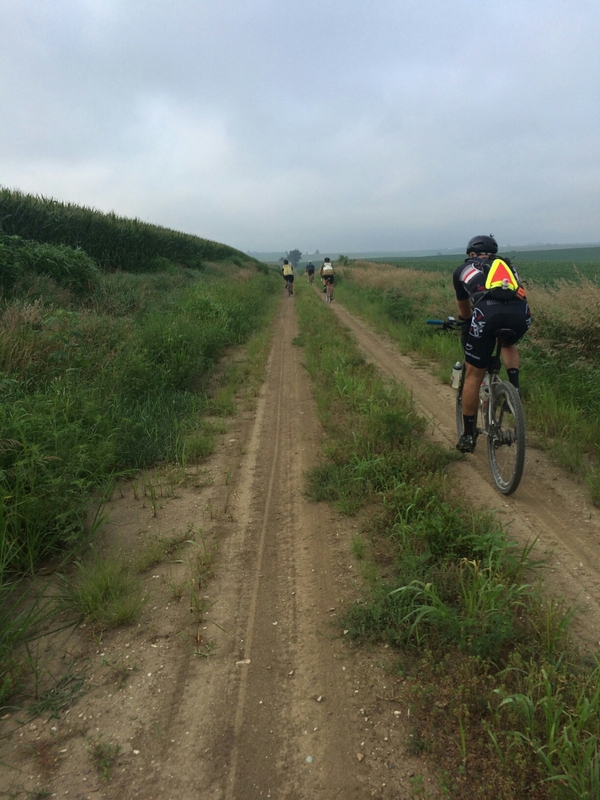 It started as a two-track and turned into a muddy, rutted, overgrown glorified cow path. We all ended up walking the toughest section and spent several minutes scraping the greasy clay off of our bikes before continuing North towards Gladbrook. We stopped at Casey’s in Gladbrook for lunch; we were pretty close to the 60-mile mark by this time. We headed North out of town and then NW towards Eldora. The route was pretty flat in this area and we were making good time. We crossed the Iowa River on Hwy 175 and headed for Casey’s towards the middle of town. We stopped here for quite a while before heading North out of town on the west side of the river. 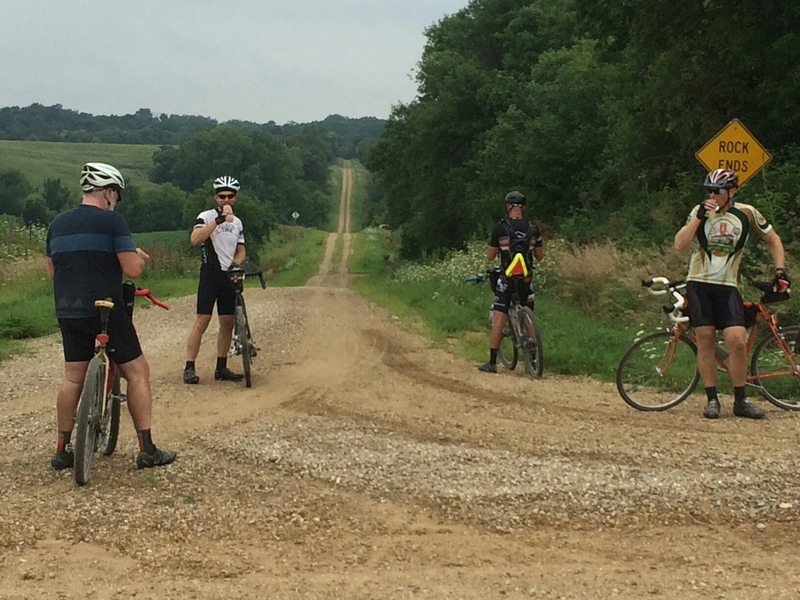 We crossed over Hwy 20 and dropped down into the Iowa River Valley. The gravel was fresh, loose, and deep, so we had to be cautious descending the steep hill. We were concentrating so hard on not crashing, that we missed our turn and continued North and up and over another steep hill. At the next intersection, we realized our mistake and turned back. When we got to our turn, Mark was waiting for us on the bridge. He wasn’t feeling well, and he was going have his wife come pick him up. As we were standing there talking, a young wild turkey walked out of a farm lane and right by us as it crossed the bridge to the other side of the river. We left Mark at about the 100-mile mark and continued East though the timbered river valley. The grade was pretty easy climbing out of the river valley and the route flattened out and took us East for several miles until we hit T-55 and then into Dike where we stopped for a short break at Kwik Star. We then crossed back over Hwy 20 and zig-zagged to the SE towards Hudson. Mark was planning on stopping at the Federal Pub for a beer or two, but since he wasn’t with us, most of the guys continued on the route towards our vehicles in Waterloo. Scott and I went into the bar and each had a beer. The locals were well primed, and they were shocked to see Scott’s extraordinary beard. They kept asking him crazy questions and he played along and gave them a few silly answers. We finished our beer and walked outside as the last two riders of our group pulled up inquiring about the RAGBRAI route. It was getting dark, so we decided to skip the cue sheets and I led everyone back to the start via the bike trail.